I have to admit to a little scepticism about lentils in my youth and am ashamed to say thought they were only for those who might also knit their own sheep’s milk yogurt. How wrong I was and I can remember the lentils that won my heart all those years ago. Following a birthday treat to the theatre (Miss Saigon) we went to a French restaurant in the West End. One of the starters was lentils with little bits of bacon and a creamy vinaigrette. I don’t know why I was led to this choice but I was and it was heavenly. 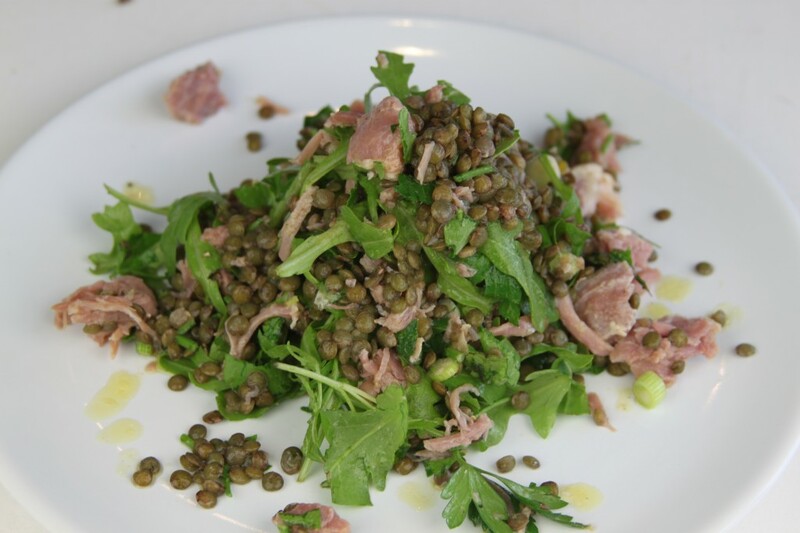 Now my larder wouldn’t be without these useful pulses and while the Sausages and Lentils (April 2013) may be a little cold weather number, this salad is perfect whatever the season. I confess I haven’t been simmering any hocks for my shredded ham. If I had it would have been perfect for a pea and ham soup or risotto and you should keep the stock if you find yourself cooking said cut. No, so determined am I that spring is imminent that I have put away such warming and comforting types of soup. I bought this ham hock at Waitrose and it is very good. This is a little more substantial than the summery lettuce salads which await us but has a suitable zip from the lemon and mustard in the dressing and verdant pep from the parsley which is more an ingredient than simply a garnish. Cook the lentils in boiling water, they will take about 10-15 minutes but check as they do vary. Once cooked drain and leave to cool. In a medium size bowl mix the mustard, sugar and lemon juice and then add the olive oil slowly, taste and season. 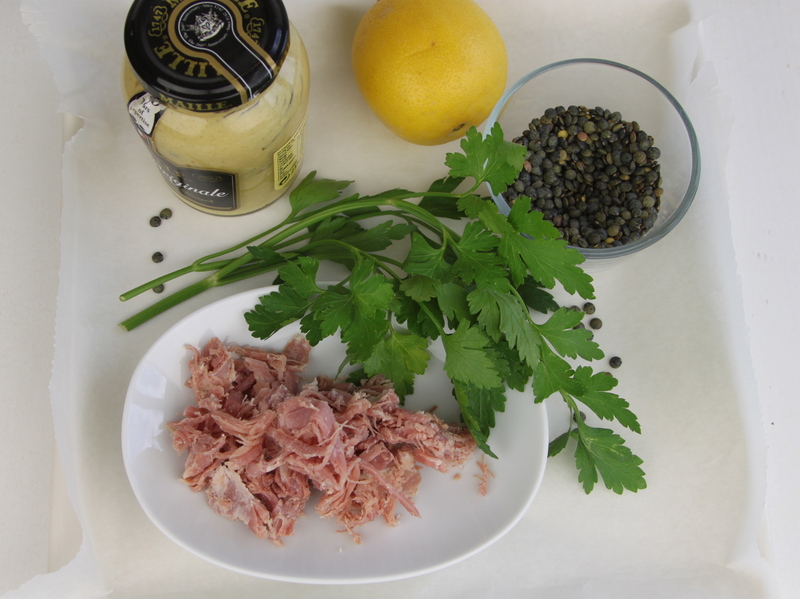 Put the lentils, ham hock, spring onions, parsley and rocket into the bowl with the dressing and give it a good mix. Turn onto a serving plate. This would do 2 adults for lunch with some nice bread alongside. This entry was posted in Food, Meat, Salads by Anna. Bookmark the permalink.